Who wouldn’t want to own a house in California, especially in beautiful San Jose? Well, we all know how that goes, right? High cost of living, lack of affordable housing – especially if you have bad credit, the dream of home ownership in this state can feel like something that shouldn’t even be attempted. But don’t worry – we’re called Home Loans For All because we truly believe that everyone can find a loan no matter what their credit looks like, which is why today we’ll be discussing how you can find bad credit home loans in San Jose, California. A lot of people ask us: why is credit so important anyway? Well, your FICO credit score is a measurement of your payment history and credit utilization. Get Help Pre Qualifying for a San Jose Bad Credit Home Loan – Click Here! It tells potential bad credit mortgage brokers in San Jose how likely you are to make the monthly payments on your mortgage – and therefore, how likely a lender is to get back any money they lend you, which is always their primary concern. Your credit score is also closely connected to your debt-to-income ratio, a comparison of the amount of debt you have accumulated in student loans, auto loans, and pre-existing mortgages to your current gross income. Most lenders like to see your debt take up no more than forty percent of your gross income. If you’re not utilizing all of your credit, it will improve your FICO score AND your D-I ratio. I Have Bad Credit In San Jose. What Now? Don’t worry, dear reader – you can still find bad credit home loans in San Jose through state and local programs, federal loan options like FHA and VA loans, or through other means. Your dream of home ownership isn’t over yet! We’ve written in the past about the types of resources that are offered by the state of California, including CalHFA programs and CalVet Home Loans. 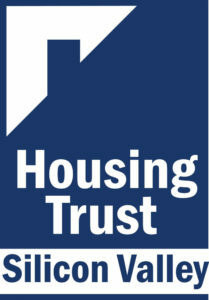 But if you want some assistance specific to San Jose, consider reaching out to the Housing Trust Silicon Valley (yes, I agree, that name really is backwards). They offer a number of down payment assistance programs to low and moderate income first-time home buyers in San Jose, which are often helpful when dealing with the higher down payments of a bad credit home loan. that are insured by the federal government, which have more favorable terms and lower income requirements. 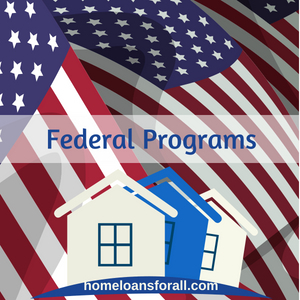 FHA loans are still given out by a private lender, but they are insured by the Federal Housing Administration of the United States government. This means that lenders are willing to consider applicants who might otherwise be rejected outright and will offer more lenient terms to those they do accept. After all, the government’s absorbing the risk! FHA loans have no minimum credit requirements, making them the most popular and arguably most accessible bad credit home loan in San Jose. However, in order to qualify for the lowest possible down payment (3.5 percent) you’ll need a credit score of 580 or higher. In cases where a San Jose buyer has credit under 580, the borrower will need to make a 10 percent down payment or provide alternative forms of credit. VA loans are a lot like the FHA loan option. They’re insured by a branch of the federal government (in this case, the Department of Veterans’ Affairs.) They have easier down payments – in fact, VA loans don’t require a down payment at all. And they have no minimum credit requirement. But there’s another big advantage, which is that VA loans don’t require you to pay Private Mortgage Insurance (PMI), which FHA loans require you to do for the entirety of the mortgage period. This means that these loans aren’t just easier to secure – they will likely save you thousands of dollars over time. If you’re not ready, not able, or just not interested in trying to apply for a government-insured bad credit home loan in San Jose at this point, you might consider a rent-to-own contract instead. 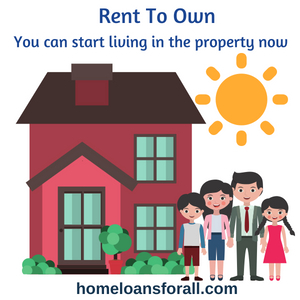 This option is exactly what it sounds like – you apply for a rent-to-own property just as you would for any other rental contract, which means lower credit requirements. At the beginning of your lease, you’ll have to pay a potential options fee much like you’d pay a down payment on a typical bad credit mortgage in San Jose. Then, throughout the course of your lease, a portion of your monthly payment will be applied towards the principal of the home. You can start living in the property now, rebuilding your credit, and saving up for the financing you’ll need to find to buy the property outright once the rental period has ended. First time buyers – especially younger first-time buyers like college graduates – will often seek the help of a cosigner on their San Jose home loan. 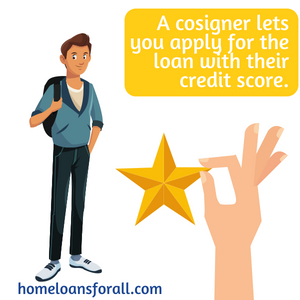 A cosigner lets you apply for the loan with their credit score (or at least with a boost to your own) which will get you better interest rates and a better chance of actually getting accepted. However, the cosigner also assumes much of the responsibility for the payments, so make sure you’re only co-signing with someone you trust. First time home buyers who have bad credit in San Jose will probably get the most utility from the FHA home loan. This loan is specifically designed for first-time buyers. If you fail to make a payment on a mortgage, your house may be foreclosed upon or you may have to file for bankruptcy. Either option will have a huge detrimental impact on your credit score. And even worse: conventional mortgages require you to wait seven years after filing for bankruptcy before you can apply for a new loan. Fortunately, bad credit home loans in San Jose require you to be a lot less patient. FHA loans only require a three-year waiting period while VA loans need even less time – a two year waiting period. During your wait, you can take steps to rebuild your credit so that you can qualify for better interest rates and terms on your next San Jose bad credit mortgage. 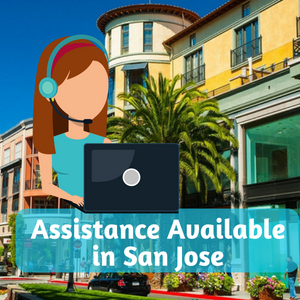 If you’re going to be purchasing a new home in San Jose, you should take advantage of all the assistance available to you. HUD-approved counseling agencies are a good place to start, as they can answer specific questions about your particular situation better than we can. CalHFA may also be offering home buyer assistance in the San Jose area. The homestead tax credit is a useful way to make a property purchased with a San Jose bad credit home loan more affordable in the future. The San Jose homestead tax exemption allows you to withhold a certain amount of money (either a flat dollar amount or a percentage of the home’s value) from your property taxes if you live in a home that you’re still paying off. Credit repair can take a long time sometimes, and a lot of people will say that you can’t do it without the help of a credit repair agency. But that’s not true. 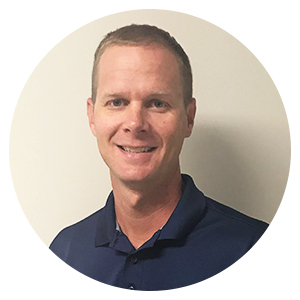 There’s nothing such an agency can do for you that you can’t already do on your own, because all “credit repair” is is proving that you are a trustworthy borrower. The first thing you need to do if you have bad credit in San Jose is to just pay your bills on time every month. 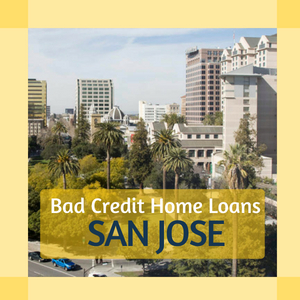 This action shows potential lenders that you are a secure financial investment and that you can be trusted to make payments on a San Jose bad credit home loan. Well, there you have it. Hopefully you now have everything you need to find a bad credit home loan in San Jose and can start living your best life in a dream home in this beautiful city. Remember: a home isn’t just a place to live, it’s a valuable long-term asset that will appreciate over time. So find yours today!